The Catholic School strives to be a community in which Christ's teachings and example are recognised in the attitudes and actions of staff, students and parents. At the same time, the school is a community where instruction and learning take place. 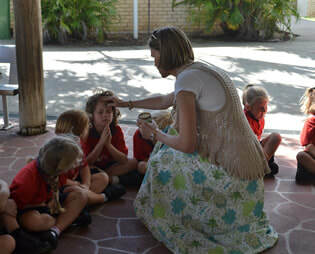 The Catholic school is very much part of the local Catholic parish community. As such, the parish priest provides leadership in the formation in faith of the school community. "Love the Lord your God with all your heart (emotional) and with all your soul (spiritual) and with all your mind (intellectual)"
In choosing to enrol your son/daughter at Sacred Heart Yeppoon you have taken another step in fulfilling the promises that were made when the child was baptised. It must be emphasised that merely enrolling your child here does not complete that responsibility which parents have in bringing their child to Christ. The Church reminds us that parents are the first and foremost educators in faith of their children. It further reminds us that the values and attitudes expressed and lived within the Christian home are essential pre-requisites if education in a Catholic School is to be meaningful. Without such support from home, the child will be subjected to opposing and competing sets of values which often results in confusion and the rejection of his/her faith. Parents have a vital role to play in the faith education of their children. You should therefore see yourselves not just as parents sending your children to a Catholic School but as parents working hand in hand with the school and the wider Church in bringing your child to Christ. We welcome children of other faiths if enrolment numbers allow. In doing so, we expect full support of the school's philosophy and goals and the expectation that you, as parents, will support your children's faith development in the context of your own tradition. In pursuit of these goals, the school provides a total education where emphasis is given to balancing the spiritual, moral, personal, intellectual and physical growth of the individual, with achievement. The responsibility for maximising growth does not rest with the school alone. It requires a shared commitment by all concerned – the individual student, the family, the Church and society. Christ is the foundation of our whole educational enterprise and Sacred Heart School strives to fulfil the direction and promises of the Gospel, so that each student is given the opportunity to become what God has intended him/her to be. "Catholic schools have a special and vital role in the Church's mission in education. Through providing a learning environment that is spiritually nurturing, intellectually challenging and emotionally caring, Catholic school communities will continue to provide support to lifelong learners so that they will be able and willing to envision and contribute to the creation of a just, equitable and compassionate world".